November is the perfect month to place focus on being Thankful using family activities to countdown the days until Thanksgiving. Join us for the 24/7 MOMS LIVE Virtual Party -(TV show on your computer). Put on your comfy sweats or PJ’s and join us for a fast paced night of "Holiday Favorites" 2 hours of Giveaways , Live MOMversation , and Tons of MOM fun. Invite your MOM friends to meet you online at the 24/7 MOMS Virtual party. MOMS, if you would like to add our "Holiday Giveaway" button to your blog, please use the code below. It can get exhausting as a mom going over math facts with our kids night after night. So why not add some fun and excitement with games that help our kids learn their math facts? The Family Game Coach is offering 24/7 MOMS 10% off their entire order. Enter the code 24/7 moms at check out. Check our the Family Game Coach web site they make great Christmas and Holiday gifts. They have a huge selection of math games and other education games, brain training games, and games that are just plain fun!! Family Game Coach's vision is to help instill a time of family togetherness that will promote character and enhance learning and develop strong family values. They encourage parents to take the home field advantage in teaching your child academics, creativity, and healthy competition by using our Game Plan. On their site parents can find more info on incorporating a family game night in their families schedule. Also rules for family game night so the entire family is encouraging to one another. You?ll be amazed at the bond playing games will create among family members and the increase in mental stimulation it will provide, even for mom and dad. WIN: 24/7 MOMS and Family Game Coach are giving away one Math Dash math game to one of our moms. What is the game of the month? (hint: click GAMES on the home page). Be sure to sign-up for their Newsletter while there. Then complete step 2 or 3 below and leave your answer in the comments. 2. Become a 24/7 MOMS Subscriber Enter your email address below then leave a comment that you subscribed along with your email address. 3. If you are already a subscriber just leave a comment that you are a subscriber along with your email address. US entries only and one entry per person. Winner will be chosen on November 15th, 2009. Create DIY ( do it yourself) Math games out of your everyday games at home to teach your kids their mat facts. Using index cards make one set of math facts (addition, subtraction, multiplication, or division)writing the math problem on one index card and the answer on another index card. The object of the game is to find pairs of matching cards in all of the face down cards. Shuffle the cards and place them face down in rows (like the memory game). The first player turns over two cards. If they match, ( Problem and answer) the player keeps the two cards and takes another turn. The next player continues by trying to find two matching cards. When all cards have been collected, the player with the most pairs wins. Board Games - Choose any of your kids favorite board games, such as " Candy Land" "Chutes and Ladders", "Sorry," "Monopoly,"or other game. Take post-it notes and write math facts (addition, subtraction, multiplication, division) and place them onto the game spaces. Play the game as you usually do, but whenever a player lands on a math space, they must answer the problem correctly before moving forward. Supplies Needed : 2 dice, 1 deck of cards, and one other player. Separate the cards and use only the ace, 2, 3, 4, 5, 6, 7, 8, 9, and 10 cards. Divide the cards into two piles one red and one black. One player takes the red cards, and one takes the black cards. First player rolls the dice and figures out the sum. Then removes the cards from their hand to add up to that sum. For example, if they roll a 4 and a 2, you can make 6 in several ways (3+3, 2+4, 1+3+2, 6, etc...). If they can't make up the sum with the cards in their hand, they roll again. After three rolls they can't make up the sum in their hand , you lose the game. You win the game if the other player can't make the sum in three rolls or if you use up all of your cards. Q:Tell us three adjectives that describe your day today. Can it really be fun to solve math problems? Yes, when playing Math Noodles our kids get the fun of solving oodles of math problems and even a few giggles. A great game for a family game night that encourages learning. Math Noodlers is a fun board game where players answer math trivia questions as they travel around the board. Math Noodlers has won several awards including Dr. Toys Best Products winner and iparenting Media Award. In the game of Math Noodles players choose a card based on the color they land on, they must either Choose it, Write it, show it, or doodle it. On choose it players answer multiple choose questions. In Show It players use the manipulatives provided to show their answer. In Write it players use a scratch piece of paper to work out their answer. In Doodle it they have to draw out their answer using pictures. Sometimes players get wacky cards where they must sing, hop on one foot or act out an answer. WIN: 24/7 MOMS and Family Game Coach are giving away one Math Noodlers math game to one of our moms. Surf these fun MATH sites to encourage your kids to sharpen their Math skills. Math Playground - An action-packed site for elementary and middle school students. Practice your math skills, play a logic game and have some fun! Rhymes Tables - The multiplication times tables can be learned using Rhymes Tables Times Tables™ in as little as one hour. It's a fun and interactive system that is easier than any other method available. Cool Math For Kids - An "amusement park of math", this site offers online games, brain benders, flash cards, and a game zone. Parents and teachers will appreciate the printable flash cards. Math Fact Cafe - Free math worksheets for elementary school and home use. This includes generators for math drills, flashcards, time, money, and more! Custom Math Sheets - Your source for free customized math worksheets! One of the most effective ways I have found to inspire my kids to learn is with the use of games. So, when I was introduced to The Family Game Coach web site I was excited to see so many options for great games to use for family game nights that inspire my kids to learn. This week we will be featuring several of their great Math games along wit giveaway so stop by daily to see how you can INSPIRE your kids Math education. The Game of Chips is a great early math game where children roll dice and choose chips based on what they roll. Children who play with dice have better math scores because they understand what's behind the number. In the game of chips this is taken even further by using the chips to form different addition problems to come up with the same number as they rolled. Example. if you roll a 5 + 3 you have 8, you may then choose the 6 and 2 chip, the 7 and 1, the 5 and 3, or any other 1 or 2 chips that equals 8. Players keep rolling until they can no longer can take anymore chips. The leftover chips are negative points. The player with the least negative points wins. WIN: 24/7 MOMS and Family Game Coach are giving away one The Game of CHIPS math game to one of our moms. Friday Fun Day - My boys count down the days until it's "Friday fun day". Tonight for the Novotny's Friday fun day we are carving pumpkins. * Friday Fun Day - Each Friday I create something " FUN" for my kids. My goal is to encourage them to keep up on their family responsibilities ( chores) , homework, daily reading etc. and on Friday we celebrate with a treat. It can be as simple as placing a fruit by the foot in their lunches with an attached note saying "Happy Friday Fun Day" or more elaborate with a family outing or at home movie night. So, thanks to my MOM friend Valerie who reminded me to place my order for my Papa Murphy's Pumpkin pizza I will now have a simple, fun and yummy Halloween dinner for the kiddos that night. Deal Of The Day - Payless ShoeSource is excited to offer Oprah Show viewers 50 percent off their entire purchase at Payless stores in the United States, Canada, Guam and Saipan*. This in-store offer is good from now through close of business on Friday, October 30. Q: If you could be an Olympic athlete, what would you be? Q: What do you call a fairy that hasn't taken a bath? Hello, this is Emma again. This time I am going to tell you about the Lily Series of books by Nancy Rue. The Lily series is not really a series that you have to go in order with. You can pick what you want to read about. The one I read was “Here’s Lily” about beauty. It’s about a girl who gets a compliment about her looks and instantly wants to be a model. Then one night before the fashion show something unexpected happens and she learns about real beauty. Also, for each book there is a side book that talks more about each topic. For “Here’s Lily” it is called “The Beauty Book.” I Love the Lily Series and already asked my m om to get more! In this fun and savvy book by noted youth author Nancy Rue, irrepressible Lily is mesmerized by a compliment about her looks and throws herself into pursuing modeling. The boys start to tease her and her friends, so Lily forms the GIRLZ ONLY CLUB. The girls support each other and prepare for a big "model search" fashion show. But when she burns her face the night before the show, Lily learns that beauty isn't about hair, makeup, and self-confidence as much as it is about health, character, and "God-confidence." WIN : 24/7 MOMS and Zonderkiz are giving away Book #1 “Here’s Lily” . US entries only and one entry per person. Winner will be chosen on November 8th, 2009. 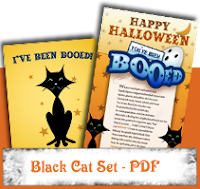 Start your own haunting with a fun neighborhood tradition – Halloween Booing! 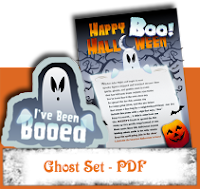 Your kids will love leaving secret "Boo" bags filled with goodies on your neighbor's doorstep to get your street into the Halloween spirit. Then watch as eventually the whole neighborhood is Boo'd! 3. Secretly leave the goodies bag with the Booing poem and sign on your neighbor's doorstep. Ring the doorbell and run to hide! 4.It's now up to your neighbor to continue the Halloween Booing fun, and haunt the rest of the neighborhood. - 1 FREE gift of $15 good towards the Kodak Gallery website (fulfilled as a digital code) per person limit. - If/once the $15 gift codes are exhausted in each phase, 40% off gift codes will be given away. - If you are the recipient of a 40% off gift code, you may come back to the promotion during the next phase to receive a $15 gift code. -300,000 $15 gift codes will be given away over the course of the promotion. Please see the breakdown to see how many $15 digital codes will be given away per promotion phase. Kodak Gallery is also giving away other gifts through other offers, totaling 1 million gifts. There are a million reasons why you’ll want to try the New Kodak Gallery, all thanks to YOU! Families across miles, offices with several employees, or baby shower guests can work together online to choose and contribute to a group gift (for one recipient). This alleviates the task of collecting the cash to another busy person. Group gift contributions do make some sense, when you know your budgeted amount for a gift will go towards a need or wish of someone special. Family/Gift Group members can register at Edivvy.com to contribute to the gift event. Edivvy.com is affiliated with several online retailers. Edivvy.com walks you through the process of choosing a gift, determining your gift group members, and creating an invitation to your members asking for their contribution. There are options such as privatizing individual contributions, allowing participants to invite others, etc. For the convenience of working out a group gift on line, Edivvy.com charges fifty-cents per member contribution and four-percent of the gift’s retail price. Should the contributions fall short or exceed the gift price, gift cards are available and will be given to the recipient following the gift deadline. Beta-Version of Lolligift.com is a “Gift Pool” service which helps gift givers give what they can towards a gift of someone’s choosing. They offer gift-giving advice and you can share these recommendations within your “Gift Pool” members. E-notices can be sent to the recipient that a gift is in the works and an E-Card at the conclusion of the collection is sent to the recipient with the well wishes of each member. Your group is sent invitations to contribute, which can be done through credit cards or PayPal. As the organizer, you are sent the funds contributed in the form of a check or to your PayPal account (3% pay pal fee) to shop where and how you choose. During the beta-period of Lolligift.com, service charges are waived. CommonKindess.com, a new online startup website, appears to be a “win-win” situation for shoppers and charities. Once you’re registered, you can choose the local charity you would like to support – or add a charity that is not currently listed. Commonkindess.com will give your choice organization a percentage of revenue from your use of coupon or discounts they offer. While you’re saving money, you’re donating to a cause of your choice. One attractive opportunity at CommonKindess.com is fundraising for schools. Anyone, anywhere, can choose your child’s school as their beneficiary – adding to the funds you could raise. Online shopping, printable grocery coupons, magazines, entertainment tickets, and local coupons are among the money saving offers found on Commonkindess.com. When you find a good deal online at CommonKindness.com, you will also be helping your community. I love appreciation and affirmation. Who doesn't and honestly many of you don't get it often enough!!! Piece of the Puzzle Affirmative Jewelry - small puzzle-shaped pewter tokens with I AM on one side and an AFFIRMATIVE WORD on the other; 40 words available loose, on small rings, as bracelets and necklaces; empowering gifts for all occasions - for yourself, family, friends, students, co-workers - for anyone who needs to be reminded of who they really are. There are nine additional tokens for your animal companion (I AM A GOOD KISSER, I AM PURE LOVE, and more). Your pet will thank you! WIN: 24/7 MOMS and The Good Cheer Company are giving away one Piece of the Puzzle Affirmative charm to one of the 24/7 MOMS. Q: If you could invent something that would make life easier, what would it do? A: "Never mind, it's over your head! " Featured on 24/7 MOMS Live Web Show as "Sweet of the week"
PREPARE brownie batter according to package directions; stir in chopped Baby Ruth. Pour into prepared pan. BEAT cream cheese and sugar in small mixer bowl until smooth. Beat in egg and milk. Using knife or spatula, swirl cream cheese mixture into brownie batter to create a marbling effect. 1. Remove ½ inch –wide strip of peel off the top of each apple and place apples in slow cooker. 2. Pour apple juice over apples. 3. Fill the center of each apple with 2 Tbsp. brown sugar, 3 hot cinnamon candies, 1 Tbsp. Butter or margarine, and sprinkle with cinnamon. You can make wonderful desserts, like this peach crisp, in the summer by using fruit from farmer’s markets. This simple peach crisp recipe allows you to really enjoy the flavor of the tree-ripened fruit. 2. Cut them into 1/4-inch slices. 3. Lightly spray a 4- to 6-quart slow cooker with vegetable oil cooking spray. 4. Layer the peach slices in the slow cooker. 5. Combine the oats, flour, brown sugar, cinnamon, nutmeg, and salt in a medium mixing bowl. 6. Add the softened butter. 7. Combine until the mixture is crumbly. You can use a fork or your fingers. 8. Sprinkle the butter mixture over the peaches. 9. Cover and cook on Low for 3 hours. Per serving: Calories 441 (From fat 231); Fat 26g (Saturated 15g); Cholesterol 66mg; Sodium 303mg; Carbohydrate 50g (Dietary fiber 4g); Protein 5g. Place ingredients in crock pot. Cover and cook on high 30 minutes. Stir occasionally. Dip pieces of pound cake, fruit, pretzels, cookies or mini marshmallows. Place whipping cream in crock pot and stir well. Add chopped chocolate Whisk until smooth and turn crackpot on to low heat for 1 hour. This chocolate dip goes great with bananas, pound cake, strawberries and so much more. Place whipping cream in a mixing bowl and add in ½ cup sugar. Beat until fluffy. Add in the yogurt and strawberries and mix well. Place in crock-pot for 20 minutes or just until slightly warm. This dip goes great with pound cake, bananas, kiwi, strawberries and peaches. Combine 3/4 cup water, brown sugar, and cocoa in a saucepan. Bring to a boil. In the meantime combine the remaining ingredients in a mixing bowl. Whisk together or mix well with a spoon. Spread the batter evenly in the bottom of a lightly buttered slow cooker/Crock Pot. Pour boiling mixture over the batter. Cover and cook on high about 2 hours; turn heat off and let stand for about 30 minutes. I made this in a 5-quart pot, but I'm sure it would be fine in a 3 1/2- quart. Spoon into dessert dishes while warm; serve with whipped cream or ice cream. Handmade candles are by far the best candles we have found to use. They always bunn great and have such unique senses! Himalayan Trading Post is a small boutique business specializing in handmade candles that are different, decorative and reusable. Himalayan Trading Post supplies high end candles to retail stores, boutiques and catalogs around the country. Our candles are all hand poured and packaged at our studio in Georgia. This allows us to maintain high standards of quality and customer satisfaction. Our wooden and glass containers are sourced from small manufacturers in northern India. We work with manufacturers directly ensuring transparent working conditions and better supplier relationships. The company was born in 2004 by owner, Julia Leaphart. Growing up in a small hill town in the Himalayas, it started as way to maintain a connection to a childhood spent in a very small but lovely corner of the world. The idea was to create eyecatching and unique candles for the home that would add a sense of warmth and character and provide a natural focal point. WIN: 24/7 MOMS and Himalayan Trading Post are giving away one Fleur de Lys Green Tea & Lemongrass tumbler candle to one of the 24/7 MOMS. Q: Who is your favorite cartoon character? Q: What bird steals from the rich to give to the poor? 2 lbs. boneless skinless chicken breast. Cook on low 8-10 hrs. Sprinkle pork roast generously with garlic salt. Place roast in slow cooker. Dissolve bouillon granules in hot water, pour over roast. Cook on low 8-10 hrs. or until you can break the roast apart with a fork. Carefully remove most of the juices from the crock pot, pour through a strainer into a measuring cup to get 1 cup of juice. For Sauce, combine the reserved 1 cup pan juices, barbecue sauce, brown sugar, honey, dried minced onion and Worcestershire sauce in small saucepan. Heat and stir until bubbly. Use 2 forks to shred pork. Return to crock and pour sauce over pork, stir to coat. Heat in crock until warm again. Serve on hamburger buns or rolls. Directions: Use a 6 qt. slow cooker. I used ground chicken and opted not brown the meat. If you use a fattier type of meat, or enjoy browning meat, go ahead and do so. Otherwise, crumble the meat directly into your stoneware, add the tomatoes, garlic, onion, and bell pepper, and add the beans. Stir in all of the herbs and spices, the salt, and the red wine vinegar. Cover and cook on low for 7-9 hrs, Or on high for 4-5 hrs. Season to taste with a bit more salt and chili powder, if desired. President Obama serves his chili over rice. Cook on low 10-12 hrs. Pour about half of the pasta sauce in the bottom of slow cooker. Add frozen ravioli. Pour additional pasta sauce, and water over ravioli. Sprinkle cheese on top. Turn slow cooker on low and cook for four to five hours. I like to serve this with either Texas Toast of garlic bread sticks. Use a 6-quart slow cooker. Trim the meat, and place it into the stoneware. Add the onion rings. Squeeze in the ketchup, and then pour the 1/2 cup warm water into the ketchup bottle and shake. Pour the ketchup-y water into your crock. Add the vinegar, brown sugar, Worcestershire sauce, Tabasco and salt. Cover and cook on low for 8 to 10 hours, or until meat shreds easily with a fork. Serve over rice, or make sandwiches on rolls or sliced bread. Dip strawberries in chocolate mixture; place on a waxed paper-lined baking sheet, allowing excess chocolate to form the ghosts' tails. Immediately press chocolate chips into coating for eyes. Freeze for 5 minutes. MOM Tip - One of my Favorite Cleaning products and tools is Mr. Clean Magic Eraser. It has erased a zillion Novotny kid signatures ( marks) left behind to remind me daily that these little people roam my halls and rooms called children. I have used it on my walls, furniture, baseboards and doors. I keep them in my cleaning supply bucket to easily access when I find ANOTHER kid signature ( marking). WIN: 24/7 MOMS and Mr. Clean are giving away a box of Mr. Clean Magic Erasers to one of the 24/7 MOMS. 2. If you are already a subscriber just leave a comment that you are a subscriber along with your email address.. Being a mom we are on our feet ALL day. And when the kids are in bed all we want to do it sit. But who can sit with the dishes, laundry, house work. etc! We have found a GREAT way to treat yourself at home and take special care of those feet! This invigorating foot scrub combines hydrating Butters, Soothing Aloe Vera and Blue Pumice to buff away dry skin leaving feet soft and rejuvenated. Pure Peppermint Essential Oil revives aching muscles, putting a little pep in your step and Tea Tree Oil to heal and brighten nails. WIN: 24/7 MOMS and Body Systems’ are giving away one Wasabi Mini Foot Scrub to one of the 24/7 MOMS.